Harvest tomatoes AND potatoes from a single plant! 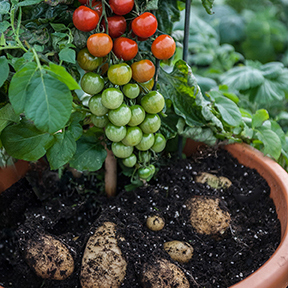 Ketchup ‘n’ Fries™ by TomTato® is a hand-grafted plant producing potatoes AND cherry tomatoes—a Plug Connection EXCLUSIVE. Above the ground you can harvest up to 500 sweet, cherry tomatoes with a high Brix level of 10 for snacking, salads, and even ketchup. Below the ground you can harvest up to 4½ lb. of tasty, white potatoes for baking, cooking, and fries. Non-GMO. Keep graft above soil level and maintain the same soil level as liner. Bury the graft up to the second set of tomato leaves from base to give tomato stability and potatoes depth.